The Utah athletics department and the Ute Indian Tribe seek to raise awareness of what it means to be a Ute with the launch of the “Ute Proud” campaign. An educational video featuring tribe representative Forrest Cuch rolled out today and will be played on the video board at all Utah home events. 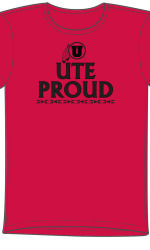 Ute Proud t-shirts, featuring a design that incorporates a graphic by a Ute artist, the circle and feather logo and the Ute Tribe’s official seal, will debut at Saturday’s Fan Fest. 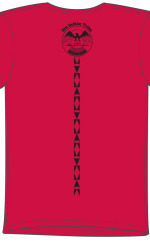 All proceeds from the t-shirt sales, which will sell for $20, will benefit Ute Indian scholarships and youth programs. In addition to the Fan Fest on Aug. 23, the shirts will be available soon at the U. Campus Store and area Red Zone stores. The education effort, which is also promoted on UtahUtes.com/UteProud and UteTribe.com, explains that the Utes are a Great Basin Native American tribe with more than 3,000 tribal members–more than half living on the Uintah and Ouray Reservation in Northeastern Utah. The Utes are important contributors to Utah’s economy through developing energy resources and raising livestock. The Utes speak their own language derived from the Uto-Aztecan language family. They were among the first tribes to acquire the horse from the Spanish, which transformed their culture. The Ute Proud campaign will include a Native American Heritage Awareness promotion for the Utah-Arizona football game on Nov. 22. Utah’s helmets for that game will bear the Ute tribal seal, the game ball will be presented to a representative of the tribe, the Ute Honor Guard will present the national colors and there will be a special halftime performance arranged by the Ute tribe’s Pow Wow Committee. This entry was posted in Uncategorized and tagged Go Utes!, Utah Utes, Ute Proud, Utes. Bookmark the permalink.